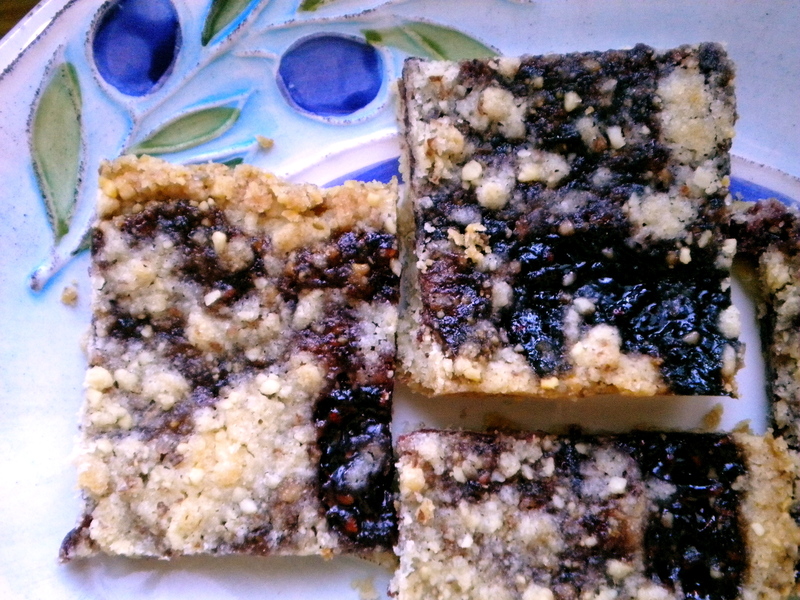 Raspberry Almond Crumb Bars – Voila! These may lack the big crunch crumbs because I processed the butter too much – but it does not lack intense flavor or deliciousness. You know those Pepperidge farm cookies with a raspberry filling? Imagine those, then quadruple the goodness, add some cooking love and ice cream and you’ve got yourself a darn good crumb bar! Of course they can be enjoyed a la carte, but when has ice cream ever detracted from a dessert? Heat oven to 350 degrees. Butter a 9×13 and 8×8 baking dish then line with parchment paper. 1. To blanche almonds: pour whole almonds in small bowl. Bring about 1 1/2 cups water to a boil in a small sauce pan. Once boiling, poor over almonds until just barely covering almonds. Let sit for about a minute. Drain and rinse with cold water. Pat dry. Add almonds to food processor and grind until very fine. 2. Measure out 1 1/2 cup almond crumbs. Save the rest for later use. Pour almond crumbs, flour, sugar and salt back into processor. 3. Dice up butter and add to flour mixture. Pulse until crumbs are about pea-sized to 1-inch. 4. Spread crumb mixture onto each baking dish, reserving about 3/4 cup for topping. Press crumbs to compress into a 1/4-inch-thick layer. 5. Spoon jam on dough; spread jam to with spoon to nearly the edge. Evenly divide rest of crumb mixture and sprinkle over jam. 6. Bake 15 minutes, rotate sheets between oven shelves, and bake about 15 minutes more, until cookies are golden brown. Serve immediately or let cool and wrap in airtight container. I can personally attest, these creations were terrific!